When I was first approached to write the Hamish McHaggis books I was just asked to write some stories about a haggis. A mythical creature is the Haggis! Some would have you believe the haggis is a three-legged creature with two long legs and one short leg, that runs around the Scottish highlands. 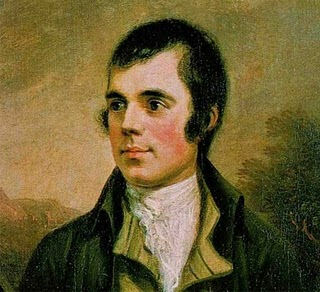 Others may be familiar with the dish that is served on ‘Burns night’ on 25th January, to celebrate the great Scottish bard Robert Burns, accompanied by toasts, assorted speeches, and even the odd glass of whisky! So where would I start? Creating a character children will love is a fairly daunting remit, but we all know that what makes a great picture book is not only the wonderful mixture of words and images but also characters that endear themselves to our young readers. (Sally J.Collins) from the very start, so we were able to bounce ideas around. We discussed what a Haggis might look like. What you see if you go to buy a haggis in a shop is not particularly cuddly, it’s basically a mottled-brown ball. But it occurred to me that if you buy a chicken in a supermarket it looks nothing like a hen in a farmyard, so a haggis would look quite different, too. I suggested to Sally that she might think about what kind of animal a haggis might be derived from. We settled on a more bear-like creature, after a couple of variations. 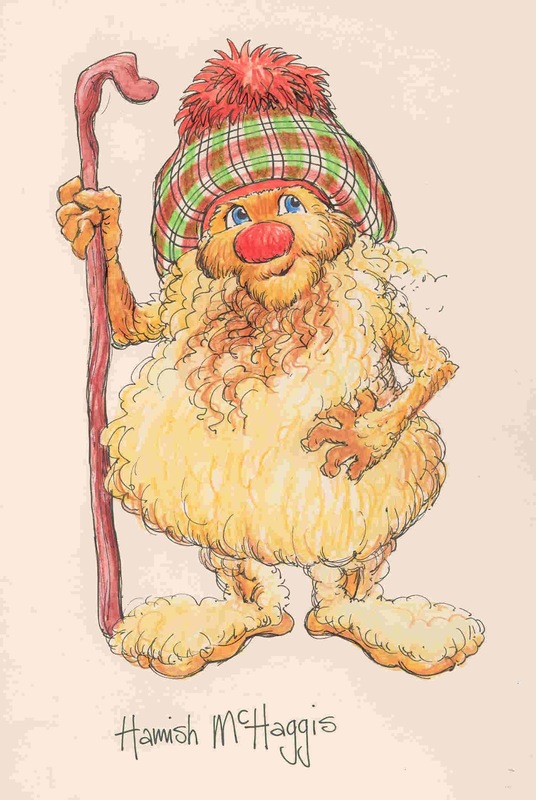 One was too babyish and another was a bit too old and had a long beard - he eventually became Hamish’s grandad Rory McHaggis. Finally, we found our Hamish. While Sally was working on Hamish had I started to think about characteristics or habits he might have. 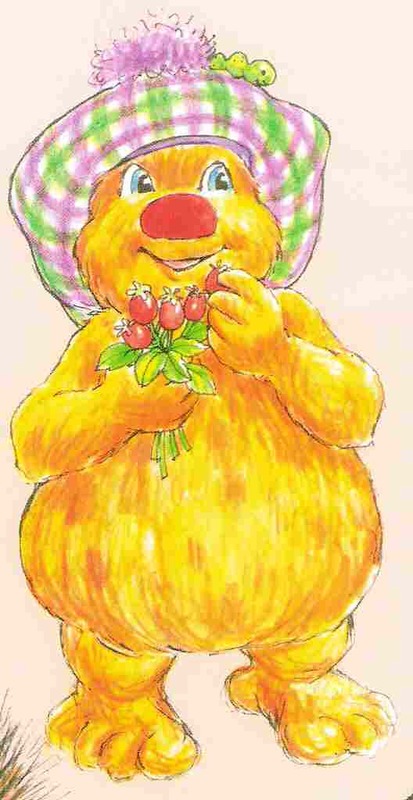 It would be fun to have the characters going on picnics, so Hamish has a picnic basket which he often worries about- where it is, what he can put in it for their picnic and if he will he get peckish on their trips away. He also has a special vehicle called a Whirry Bang, designed by Hamish himself which can be a little unreliable at times. Hamish needed a place to live and so he got a little grass and heather-covered house called a Hoggle. 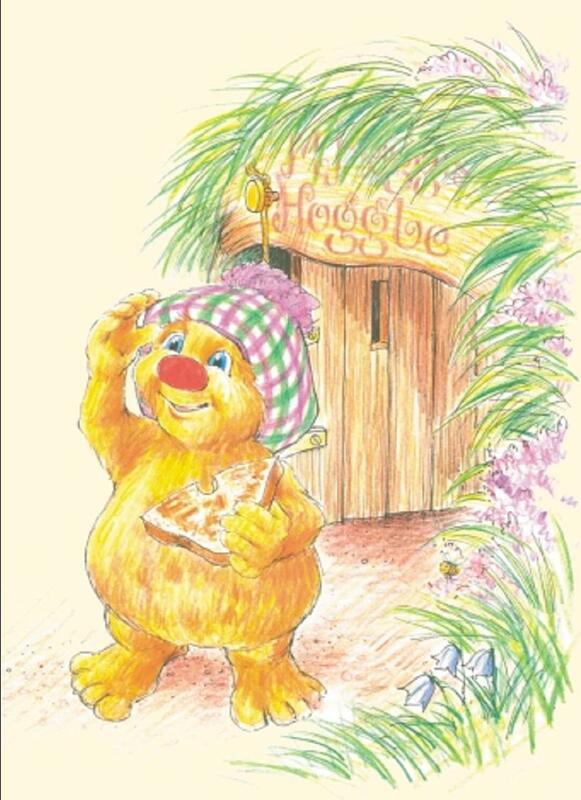 I thought Hamish should live in a secret hideaway in the Highlands and Coorie Doon (which, in Scots, means to 'snuggle down and be cosy') seemed like a good place. Hamish needed some woodland friends and I wanted to choose some that were less common creatures such as a pine marten (Angus) an osprey (Jeannie). 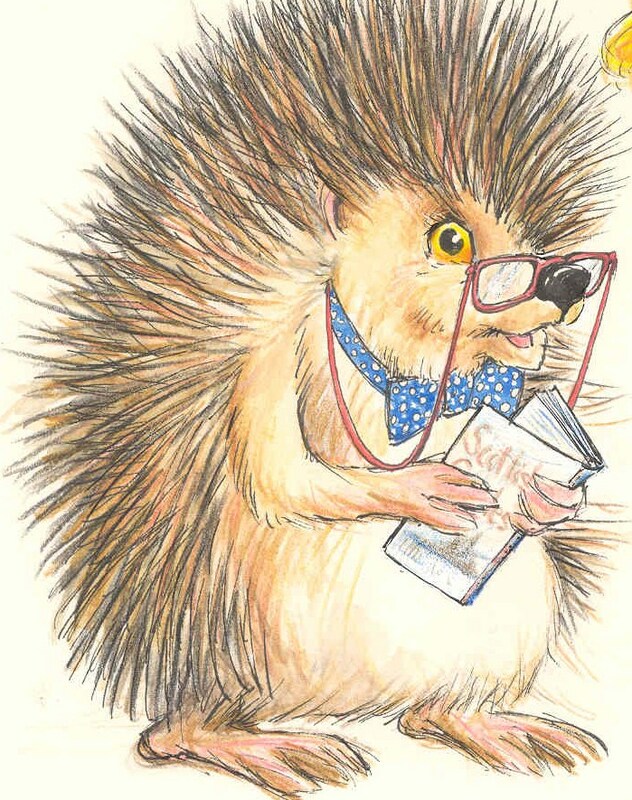 As Hamish uses lots of Scots words and phrases an English hedgehog (Rupert) seemed like a good idea as someone who needs the odd word translated. 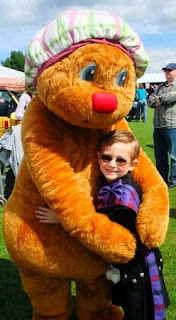 Hamish also meets up with other friends and relatives during the series such as his grandad Rory (above)who lives in Glamis castle, the international clan members - McHaggises from all over the world who come to visit for the Clan Gathering. There’s also Jeannie’s brother, Joe, on the isle of Skye, Shona the red squirrel who lives in the grounds of the royal castle at Balmoral and Nessie (the Loch Ness Monster). Sally was not keen to draw clothes on the animals so we decided they would have accessories - Hamish has his hat, and Angus has a red cap which he wears backwards, Jeannie has pink beads and Rupert has a bow-tie and a pair of glasses. 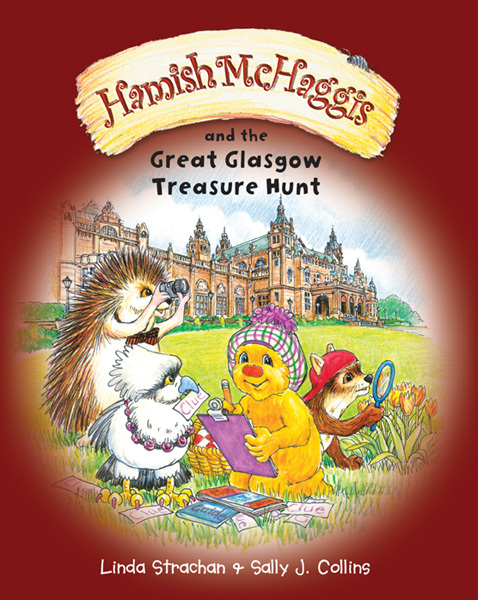 There are now ten books in the series and the latest Hamish McHaggis and the Great Glasgow Treasure Hunt was launched last weekend at the Kelvingrove and Riverside Museums in Glasgow. This book has a new character, Maggie the Glasgow fox, who has a rather capacious handbag! 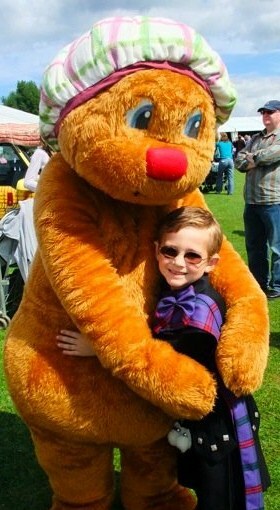 Hamish has many fans of all ages and he often gets cuddles when he surprises them with a visit. 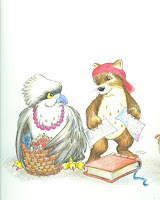 Linda Strachan is the award winning author of over 60 books including Writing For Children pub A. & C. Black. A difficult brief, Linda, but you've done brilliantly with it. Good to hear about the character's development, and especially about how you work so closely with your illustrator - I never get the chance to do that. I like the early sketches! Thanks, Malachy. We've had a lot of fun with Hamish and it is great have the chance to continue working together as a team. What an amazing opportunity to create an entire world for Hamish. I love the idea that they have accessories rather than clothes and found the developmental sketches fascinating. Thanks for sharing them. I enjoyed hearing how Hamish McHaggis was created and the extras that were added to bring him alive (such as his hoogle). I liked his hiking boots - what made you both decide not to keep them? And do you find American visitors are especially fond of Hamish? Yes, I'm nosy! Yes, Paeony, we have a lot of Hamish fans from all over the world and lots of Scots like to send them to family members as a little reminder of home. 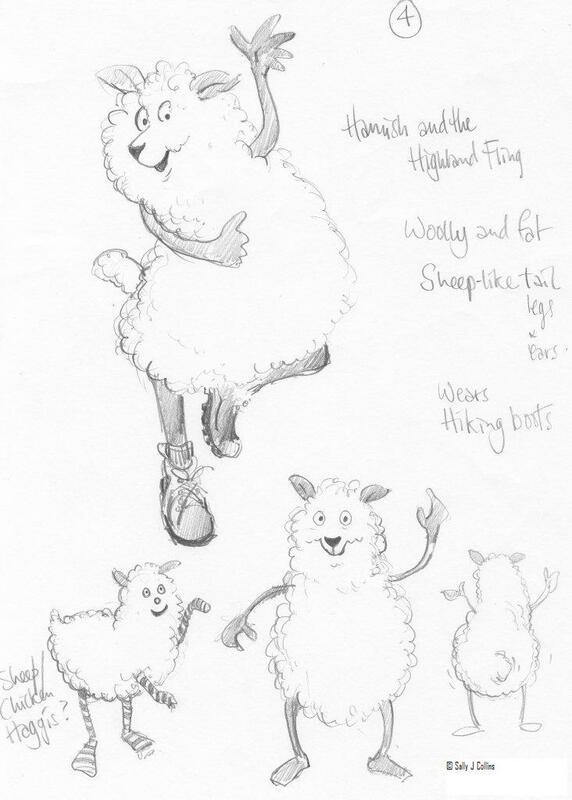 The hiking boots were just in that first version, which later became hi granddad Rory but I know Sally is eager to draw Hamish in wellies. My wish is to have a series of books like yours one day. So my readers and I get a chance to fall in love with the characters as they grow, just as your readers have fallen in love with Hamish and his friends. 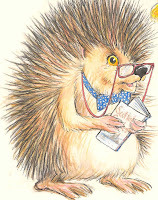 Should you ever need any info on hedgehogs for work sheets etc. then just drop me an email. Have rescued them for around 20 years so know a bit about them! It has been a lot of fun creating Hamish and friends and going back to them each time is great because I know exactly how they will behave in any situation. We've also enjoyed developing new characters like Maggie the fox in the new book. I will get back to you about the hedgehogs, Lynne, thanks! I loved learning how a series like this is created. It's so interesting how much you started with the character and developed him before even beginning to plot. I guess as writers we each have our own way of doing things - I often start with plot and I find the character just comes walking in. But you've really inspired me to go away and have a long think about character first! It's always fascinating to hear how other people work, Abie. I almost always find myself starting with character. Once I know them well the plot often seems come from how they would react in a situation. Very interesting to see how Hamish and his world developed, thanks for sharing, Linda. As others have said Linda, it is great to be given an insight into developmental aspects that are often not known about unless you are an author or illustrator, or you work in publishing or films (where characters and their distinct characteristics are captured on style sheets). Thanks, Linda. What an exciting opportunity to work really collaboratively with an illustrator. It's an unusual thing to be able to do -although it's often what picture book readers assume goes on. Good luck with the Glasgow book. I have often worked on picture books where I never get to meet or speak to the illustrator. It is a completely different experience to work so closely with an illustrator and I have enjoyed it, but it may not be for everyone, or for every book. There is the possibility that it could go very wrong if personalities clashed!